These Anti-Kicking Sleeping Bag With Feet Wearable Blanket for Baby Boys and Baby Girls. These Anti-kicking sleeping bag suitable for 4 season---spring/summer/autumn/winter. These Cotton Muslin Wearable sleeping bag is a great baby gift for sleep and shower gift. These Cotton Muslin Sleeping Bag With Feet have Flamingo/Dinosaur/Cartoon/Floral Pattern. Muslin cotton, It is exceptionally breathable to reduce overheatingand ensure comfortable sleep for babies. for infant, with the shell also made from100% cotton.Help you enjoy parenting day. all night, which makes this sleepwear an ideal replacement for old loose blankets. 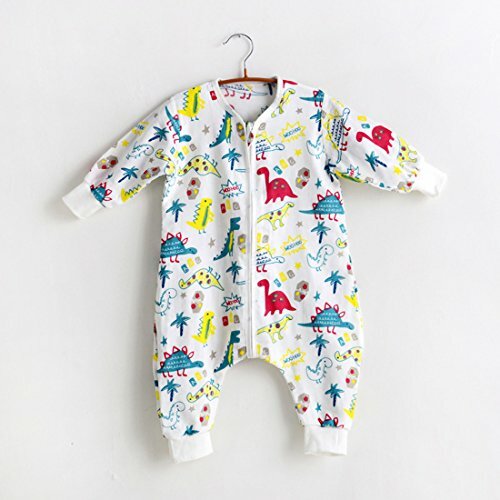 Size M: Baby Sleep Bag Length 27.5" (70 cm), suitable height approx. 27.5"-33.5", 0 - 18 months, middle zip with protective zip cover. Creates a safe and comfortable breathable sleep environment, keep warm but not over-heated. Washing Guide: Hand wash( max.30℃) Do not bleach; Do not dry clean. If you have any questions about this product by The morning, contact us by completing and submitting the form below. If you are looking for a specif part number, please include it with your message.